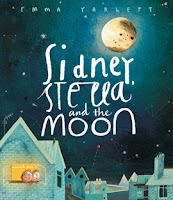 Sharing is important but not to Sidney and his sister Stella, until one fateful night when a bouncing ball they are fighting over hurtles out of the bedroom window and bounces so high it shatters the moon. The two siblings are horrified! One moment the moon is shining and next it is gone, leaving the town in darkness. What happens next is portrayed in a double page spread inviting the reader to open the children's front door and look outside. There are television news crews everywhere. A reporter with a microphone broadcasts the breaking news that the moon has disappeared, while moon balloons and moon ice creams are being sold on street corners. Every second person is reading a newspaper with the headlines, "Vanished" and "Who would steal a moon?" Sidney and Stella quickly realise they have to find a replacement moon. Emma's quirky illustrations capture the children searching for something in their home which could become a second moon. Their frantic efforts leave them tired and hungry. When Sidney takes a big round cheese out of the fridge and starts nibbling, he finds the answer to their problem. Stella comes up with the idea of using her skipping rope to catapult the cheese into the sky. But Sidney thinks he should do it and Stella disagrees. Will they never learn to share? Fortunately they do, and once again the moon is in its rightful place. I liked the simple but very effective drawings and the use of a wide palette of colours in this engaging picture book. The message of sharing came across in a direct but fun way, making it easy for children to accept and, hopefully, emulate. The stand-out cover design embellished by a sprinkling of silver stars is bound to attract readers.